Due to the manufacturing process, handling and shipping, case mouths may not be perfectly round. All brass should be inspected, full-length sized, trimmed, inspected and chamfered before loading. This includes both new and once fired brass. A light "staining" may be found on the brass. This is due to annealing. Annealing is a process, performed by the manufacturer, which involves rapid heating to a specified temperature followed by rapid cooling. 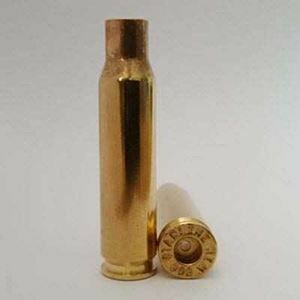 This process imparts cases with the proper hardness to securely hold a bullet as well as gives flexibility to expand and contract upon firing and repeated forming and is a residue from this process. Staining can also occur in transit and storage due to high humidity. This stain may be removed by tumbling before loading. Starline Brass, located in a state of the art facility in Sedalia, MO, is the top choice of many competition shooters and reloading enthusiasts. Founded in 1954, and a family owned business, they take great pride in all of their products. Many professional shooters insist on Starline Brass, as they expect top notch performance and flawless functioning during competition and reloading.. 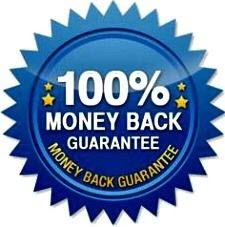 They are well know for producing the best bulk reloading brass in the industry. 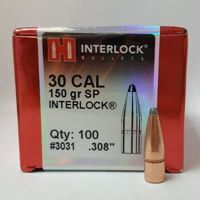 100 pk 30 Caliber 150 SP Hornady Bullets. Free Shipping.